Who’s Diggin’ the Blues This Year? 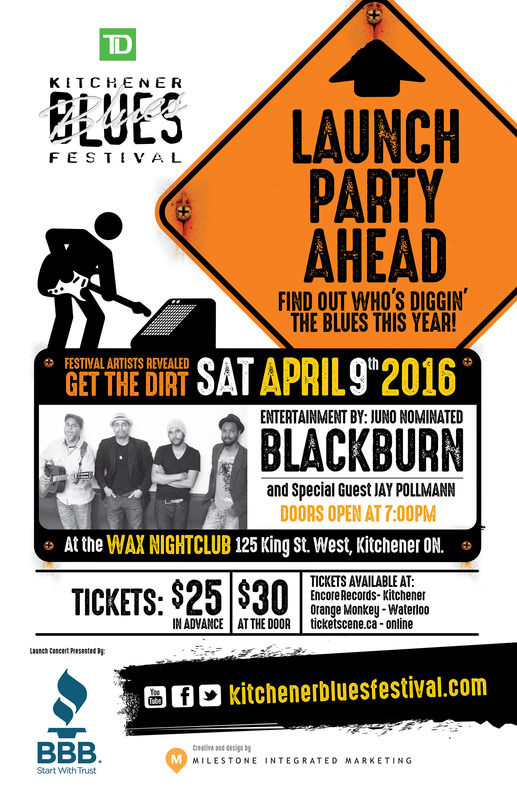 If you are a fan of blues music and a great party, then there’s an event happening on April 9th that is calling your name. This year, the Kitchener Blues Festival sponsored by TD Canada Trust is hosting a launch party to kick off Burnin’ up the Blues. The party will feature entertainment by Juno-nominated artist Blackburn and special guest Jay Pollman. Plus, the line-up for the 2016 Festival will be announced. Tickets are $25 if bought in advance and $30 at the door. They are available to purchase here, and at Encore Records and Orange Monkey Records. Doors open at 7 p.m. and the show will begin at 8 p.m. at the Wax Nightclub in Downtown Kitchener, 125 King St. W.
Are you ready for family fun in Waterloo Region and its vibrant winter events? Every year, our region plays host to so many exciting outdoor and indoor events that are sure to excite the whole family. Whether you’re looking for free events or are ok with spending a little cash, you’re in luck! June 19th marks 25 years since the Canadian Clay & Glass Gallery opened its architectural award winning gallery in Waterloo. It remains the only Canadian art gallery exclusively dedicated to exhibiting and collecting ceramic, glass, enamel and stained glass.